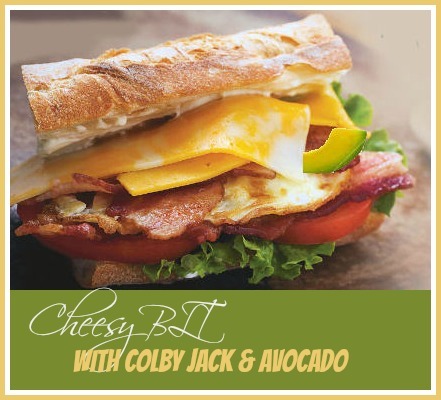 This great Cheesy BLT recipe combines Colby jack cheese with tangy mayo and veggies, as well as a fried egg. It will be sure to satisfy the most hearty eater. Hearty Cheesy BLT Hits the Spot. Who doesn’t love a BLT? There are many versions of them, but each one seems to have its own appeal. The crusty bread and fried egg takes this BLT from ordinary to extraordinary and it is one that rivals any upscale luncheon restaurant. Perfect for lunch with special friends. What is your favorite way to make a BLT? Please leave your suggestions below. For more great recipes – visit my Facebook Gardening Cook Page. This cheesy BLT takes the recipe up a notch with the addition of avocado and Colby Jack cheese. Preheat oven to 350 degrees. COOK the bacon on a rack in the oven until crisp. About 15 minutes. Drain the bacon on paper towels. Cook the egg in the olive oil over medium heat 3 to 4 min. or until white is set and yolk is cooked to desired doneness, turning after 2 min. Remove from heat. Break bacon slices in half. Top egg with 2 bacon pieces and cheese. SPREAD cut sides of bread with mayo; fill with lettuce, tomatoes, remaining bacon pieces and egg. I just found your recipes, and I think I’ve gone to heaven! One question though about the delicious looking Cheesy BLT with Colby Jack and Avocado……you say 1 large piece of Cos…..what is Cos? I’m sorry if I missed something that is quite apparent. Thank you so very much! Hi Linda. Glad you are enjoying the site. Cos is the long narrow leaf lettuce. Also called Romaine Lettuce. I love it because one leaf is a perfect size for a sandwich when trimmed and it lies flat. Thank you Carol, for such a quick response. I’d have never guessed that it was Romaine. I gave my sister your link and I’m sure she will love it as much as I am!